Currently in for the long haul on the Mamma Mia production after a long stint in the brilliant Matilda The Musical, Zoe wouldn’t have it any other way! This petite triple threat performer loves working hard and has grabbed her opportunities and turned them into successes and learned experiences to help propel her career. She has embraced her time being in ensemble cast, to swing to dance captain. Trained in all genres, Zoe is most comfortable on the stage in music theatre but maintains her training in all styles to remain sharp and relevant. She knows the industry can be fickle, so she strives to keep up-to-date and fresh to keep doing the job she loves! Zoe is a new talent to be noticed. Please enjoy our recent conversation with Zoe Komazec. Q: So you’re currently with Mamma Mia? Yes, I started in October 2017. It’s such a good show, you can’t help but get up and dance and party at the end. Before this I was in Matilda The Musical in Australia and New Zealand. Q: Tell me how do you cope being in a production long term? But because I’ve got so much passion and so much love for the industry and for the show and for performing, the time goes by so quickly and I just want to hold on to every single moment that I can. Q: How many shows are you doing a week? And do you get days off? We do eight shows a week. We get Mondays and Tuesdays off, which is awesome. So, we do two Wednesday shows, one Thursday, one Friday, two Saturday, and two Sunday. But I’m a ‘swing’ so sometimes I don’t do any, and then sometimes I do the full eight. Q: So being a swing means you can move around the various dance roles? Yes. As a swing I cover all of the ensemble female roles, firstly. And then, if lots of people are off at the time (sick or injured) I can go on for male roles as well. So, anytime we’re not on stage we’re either going over some more plots and practising, or we’re having all the down time, doing a bit of a stretch and just keeping our bodies nice and fit and ready to jump on stage if we need to. Q: You have just come off Matilda, what did you do in that? I was the child swing, like the child cover. I was an adult swing and I was also the assistant dance captain on the show. It was so fantastic. The show is just phenomenal! I was really lucky because as the assistant dance captain, I got to work with the kids, mostly. And because I was their cover as well, I got to work with them on stage, and off stage, and in rehearsals. So, I got a really good bond with the kids. And then, obviously, being able to swing some of the adult tracks as well was really exciting. It was my first time swinging as well. On my first day, I was kind of like “Oh my goodness.” I was swinging all the eight children, and then, later down the track I was then swinging the three lead females. And then, some of the boys’ tracks I had to know, just in case, as well. So, it was a big eye-opener, when I first jumped in, but it definitely solidified my love of swinging. I’m a little bit OCD with my organisation, so swinging suits me. Q: So, tell me, in these long productions, how do you keep it fresh? We have a really fantastic resident choreographer, director, and music directors. And they keep on top of the show by giving notes and giving you new ideas, and that sort of stuff. Our residents are fantastic with that, ’cause they understand it is a long-running show and they don’t want us to get really monotonous, and we’re saying the same things all the same way. They also keep it so it stays nice and tight and clean, and that it has the same amount of energy. But one of the most rewarding things is just hearing the audience applaud. You remind yourself that… “These people are here to see the show, and I’m going to give it my absolute best, 110%” … And then, once you get that applause at the end, it’s a feeling like no other. We’ve got really good camaraderie within the cast. So, if one person is maybe not feeling 100% or might be a bit tired, or everyone else in the company will join together and will try and get some energy in. I don’t know, you just pull it out from somewhere, sometimes you don’t know how. Particularly with the eighth show of the week. But no, it’s definitely the audience and the people around you, plus our wonderful residents that just keep the show going, and in tiptop shape. Q: How did you start dancing? And how did you go about making a career happen? Well, I grew up dancing because my mum owned a dance school. But it really started with my older sister, Nadia. When she finished school she got straight into Phantom of the Opera, playing Meg Giry. She went straight to Singapore for three months, and then she toured the whole of Australia with the show for about three years. It just looked amazing and I wanted to be a part of that. I was obviously more of a music theatre, jazz and tap kind of a dancer. I still do ballet and I still do contemporary stuff, but it was pretty clear I wasn’t going to be a ballet dancer. So, obviously, there are only so many avenues left. Musical theatre was just always there for me — I grew up watching all the old musicals with Gene Kelly and Frank Sinatra, like Singing in the Rain, and On the Town and all those wonderful old films. My sister and I used watched them constantly as kids. And then, I saw it was possible, if you keep working hard, to get into a show. And my sister really kind of put that idea in my head, even though I’m from Adelaide! My sister made me hungry to follow ion her footsteps. Q: Did you do any full-time training, or just got straight into auditions? I didn’t actually. I did my training at my mum’s dance studio until I was about 18 and I finished Year 12 at school. And then I did the TV show, The Fairies, where I was the Rainbow Fairy. That gave me a lot more confidence. So, then I started going for auditions and my first professional show was Cats in 2010, when I was 19. Q: The Choreography in Mamma Mia is quite fun, and the dancing kind of makes the show… So, is it the original choreography? No, it’s actually new choreography for this particular production by Tom Hodgson. He was the associate choreographer on Matilda as well, which means we’ve been able to work together for a couple of years now. His choreography is fantastic! There’s a lot of detail. Sometimes when you watch it, particularly a number like Voulez Vous, there’s so many people on stage, and there’s so many things happening at once. But without it being detailed and clean, it’s not as clear. Q: So what do you do when you’re not working? Where is your happy place? That’s a hard question! (Laughs) Well, my fiancé and I run a little business… So that’s sometimes a bit of an escape. My partner and I run The Ignyte Summer School in Adelaide in January every year. We take our wealth of knowledge of people and wanting to teach kids and open them up to the possibilities that are out there, and we bring in industry professionals to teach all these wonderful kids. And that’s definitely something that I put my time and energy into. But I guess my happy place would be with my family, with my partner, and with my little dog, Tino, and my cat, Cally. Q: What would be your bucket list job? I’d love to be in Frozen. That’s definitely something I would absolutely love to be in! Q: What’s something that you’ve learnt about yourself in this career? I have learnt a lot. learnt a lot about myself as a person. I’ve learnt to utilise the people around me, and my surroundings to push myself and to learn really important lessons. And to take on their experiences as well, and try and learn for the next step. And I’ve definitely come to a point now, that I really strive to be happy with what I’ve got and to be really proud of how far I’ve come so far. Q: Do you have any advice for people who might want to get into music theatre, or professional dancing? But if you go in and say, “Actually, I haven’t done a class in about two years, or I haven’t gone to a singing lesson in six months, so my repertoire wasn’t up, or for whatever reason.” So, I find it’s really important to keep training and going to class, and doing singing and acting lessons too. I feel like you never stop learning, no matter how many jobs you have. If you’re the lead in one show, or a swing, or whoever, you have to keep striving for your knowledge. I don’t agree with comparing yourself to other people, but just evaluating your own performance. If you’re someone who is a bit slow to pick up choreography for example, then go to classes a bit more, just to get that skill back up. Know what you need to work on. Q: What’s on repeat on your playlist at the moment? ‘You Can Call Me Al’ … the old Paul Simon song! I was grooving to it as I was getting ready today. I just love the backing track, it gets me going. I just can’t wipe the smile off my face. Q: What will I always find in your handbag? There’s always lip balm everywhere I go. I’m a Chapstick girl. I’ve got one in my wallet, I’ve got one in my handbag, I’ve got one in dance bag. (Laughs) I’ve got them everywhere. Q: What is always in your fridge? I always have some skimmed milk in there for a coffee. Always. Just have a little splash of milk in my coffee every morning, and that gets me going. Q: Are you binge watching anything at the moment? I’m binge watching Orange is the New Black with my sister, as I’m living with her in Melbourne right now. It’s great! Born into a theatrical family, Zoe discovered her passion for performing very early, beginning her training in the arts at the age of two at her mother’s studio in Adelaide, Barbara Jayne Dance Centre. Zoe went on to make her professional debut in the role of Tantomile in Cats in 2010 – a role she then returned to once again in 2015. 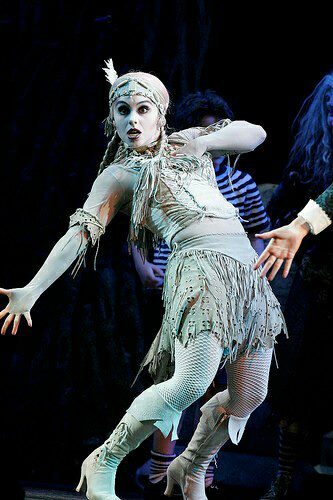 In between, Zoe was part of the Australian cast of The Addams Family Musical where she understudied the role of Wednesday Addams. Most recently Zoe has toured Australia and New Zealand with the hugely successful Matilda The Musical as Swing and Assistant Dance Captain. Zoe has been featured as a singer and dancer at various corporate events in Sydney, Melbourne and Adelaide. Her on stage credits also include the International hit production The Illusionists 2.0 where she was engaged as a Dancer and Assistant as well as Dance Captain for the show. On screen, Zoe played ‘Rainbow the Activity Fairy’ in the popular Children’s TV Series The Fairies for Channel 7 and has appeared in numerous film clips and television advertising campaigns.